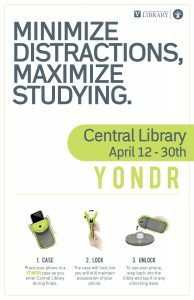 Starting today and lasting through April 30, Central Library will be piloting Yondr, a solution for distraction-free work and studying. Click the flyer on the left for a quick overview of how Yondr works. The Yondr case allows you to keep your cellphone with you at all time but keep the technology locked away to minimize distractions. If you need to use your phone while it’s in the case, you can always go to the Yondr base in the Central Library lobby and unseal the case to access your device. 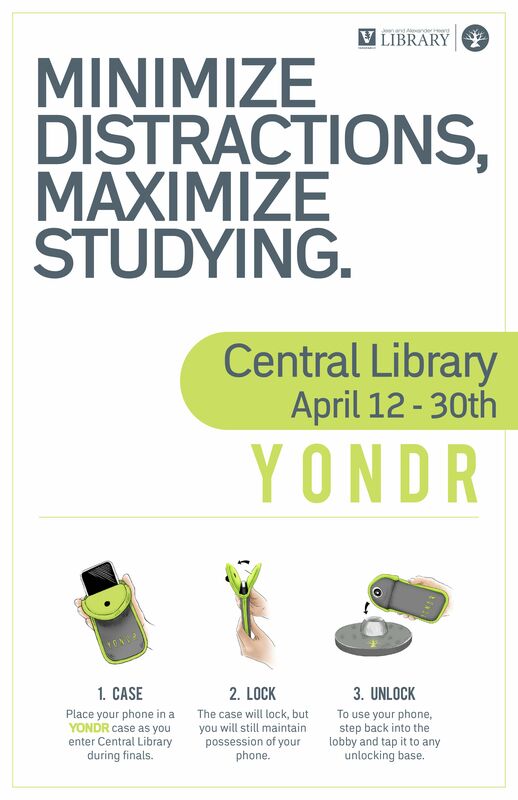 Minimize distractions and maximize studying — try out the Yondr experience the next time you are in Central Library! For more information, please see the flyer or check out the Yondr website.